Saint John of Shanghai and San Francisco (Russian: Иоанн Шанхайский и Сан Францисский Ioann Shankhayskiyi i San Frantsiskyi; secular name Mikhail Borisovich Maximovitch, Russian: Михаил Борисович Максимович, Serbian: Михаил Максимовић, translit. Mihail Maksimović; 4 June 1896 – 2 July 1966), was a prominent Eastern Orthodox ascetic and hierarch of the Russian Orthodox Church Outside Russia (ROCOR) who was active in the mid-20th century. He was a pastor and spiritual father of high reputation and a reputed wonderworker to whom were attributed great powers of prophecy, clairvoyance and healing. He is often referred to simply as "St. John the Wonderworker". Born in 1896 in the village of Adamovka in the Kharkov Governorate (in present-day eastern Ukraine). He came from the same family of Serbian origin as that of St. John of Tobolsk, whom he was said to resemble in several respects. From 1907 to 1914 he attended Poltava Military School. He received a degree in law from Kharkov Imperial University in 1918. His family brought him to Belgrade in 1921, where in 1925 he graduated from Belgrade University with a degree in theology. In 1926 he was tonsured a monk and ordained a hierodeacon by Russian Metropolitan Anthony (Khrapovitsky), who gave him the name of St. John after his saintly relative. Later that same year, he was ordained to the priesthood by Russian Bishop Gabriel (Chepur) of Chelyabinsk. For several years afterward he worked as an instructor and tutor in Yugoslavia. He worked as a religious teacher in the Gymnasium of Velika Kikinda between 1925 and 1927. In 1929, Holy Synod of the Serbian Orthodox Church appointed him a teacher of the seminary in Bitola. The principal of the seminary was Nikolaj Velimirović. In 1934 he was ordained a bishop of the Russian Orthodox Church Outside Russia by Metropolitan Anthony and assigned to the diocese of Shanghai. In Shanghai, Holy Bishop St. John found an uncompleted cathedral and an Orthodox community deeply divided along ethnic lines. Making contact with all the various groups, he quickly involved himself in the existing charitable institutions and personally founded an orphanage and home for the children of indigents. Here he first became known for miracles attributed to his prayer. As a public figure it was impossible for him to completely conceal his ascetic way of life. Despite his actions during the Japanese occupation, when he routinely ignored the curfew in pursuit of his pastoral activities, the Japanese authorities never harassed him. As the only Russian hierarch in China who refused to submit to the authority of the Soviet-dominated Russian Orthodox Church, he was elevated to Archbishop of China by the Holy Synod of ROCOR in 1946. When the Communists took power in China, the Russian colony was forced to flee, first to a refugee camp on the island of Tubabao in the Philippines and then mainly to the United States and Australia. Archbishop St. John travelled personally to Washington, D.C. to ensure that his people would be allowed to enter the country. In 1951 St. John was assigned to the archdiocese of Western Europe with his see first in Paris, then in Brussels. Thanks to his work in collecting lives of saints, a great many pre-Schism Western saints became known in Orthodoxy and continue to be venerated to this day. His charitable and pastoral work continued as it had in Shanghai, even among a much more widely scattered flock. In 1962 St. John was once again reassigned by the Holy Synod to the see of San Francisco. Here too, he found a divided community and a cathedral in an unfinished state. Although he completed the building of the Holy Virgin Cathedral and brought some measure of peace to the community he became the target of slander from those who became his political enemies, who went so far as to file a lawsuit against him for alleged mishandling of finances related to construction of the cathedral. He was exonerated, but this was a great cause of sorrow to him in his later life. Deeply revering St. John of Kronstadt, St. John Maximovitch played an active role in preparation of his canonization. On July 2, 1966 (June 19 on the Julian calendar), St. John died while visiting Seattle at a time and place he was said to have foretold. He was entombed in a sepulchre beneath the altar of the Holy Virgin Cathedral he had built in San Francisco dedicated to the Theotokos, Joy of All Who Sorrow, on Geary Boulevard in the Richmond district. In 1994 he was solemnly glorified on the 28th anniversary of his death. His unembalmed, incorrupt relics now occupy a shrine in the cathedral's nave. His feast day is celebrated on the Saturday nearest to July 2. 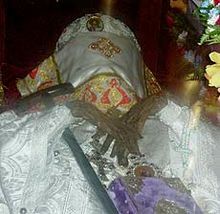 He is beloved and celebrated worldwide, with portions of his relics located in Serbia, Russia, Mount Athos, Greece (Church of Saint Anna in Katerini) Bulgaria, Romania, United States, Canada (Holy Trinity Serbian Orthodox Church, Kitchener), England (Dormition Cathedral of the Russian Orthodox Church, London) and other countries of the world. ^ Le Karo, Bernard (2013). Свети Јован Шангајски - чудотворац последњих времена [Saint John of Shanghai - the Wonderworker of the Late Times]. Belgrade: Православна мисионарска школа при храму Светог Александра Невског. ISBN 978-86-86555-64-9. ^ a b "Crkva danas slavi svetog Jovana Šangajskog" [Saint John of Shanghai Celebrated Today]. Radio Televizija Vojvodine. 2 July 2009. Retrieved 28 May 2016. Rose, Fr. Seraphim & Abbot Herman. (1987). Blessed John the wonderworker: A preliminary account of the life and miracles of Archbishop John Maximovitch (Third, revised ed.). Platina: St. Herman of Alaska Brotherhood. ISBN 0-938635-01-8. Father Seraphim: His Life and Work ISBN 1-887904-07-7. This page was last edited on 17 January 2019, at 02:38 (UTC).